Arrive KushokBakula airport Leh - 3500m above sea level. Transfer to hotel. Half Day at rest for acclimatization. 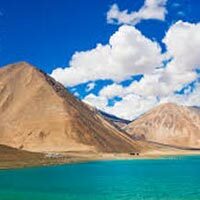 After lunch Visit Shanti Stupa &Leh Palace, Later in the evening walk around local market. Dinner and overnight stay at the Hotel Leh. Day trip Leh to Pangong leave early morning at 5am to Pangong Lake through changla pass 5486Mtrs. While ascending changla pass 5486Mtrs. Enjoy the beautiful panoramic view .the village below the pass. After crossing the pass half for picnic lunch at tsoltak, the summer pastureland of the yaks. Arrive Durbuk and from there a short drive takes you to the western shore of the lake. Enjoy the land scape in the back drop of the lake. 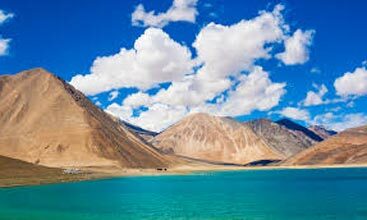 This famous blue brackish lake of pangong is 5/6 kms wide and over 144kms long with half of it running the other side of the” indo china border” one rarely feels so close to nature and environment and the scenery is unforgetting. Back &over night Hotel. Depart. Leh On time departure transfer to Leh airport , wish you best for another tours from Ladakh all tours.